Following amendment is carried out in this office earlier Part II O.O. No. 1458 dated 12.10.2018. Para 7 - The successful individuals are eligible to get Special Pay as per Para 106 of Office Manual Part I (2014 edition) w.e.f. 16.11.2017 i.e. date following the last day of SAS Part-ll Examination 2018. 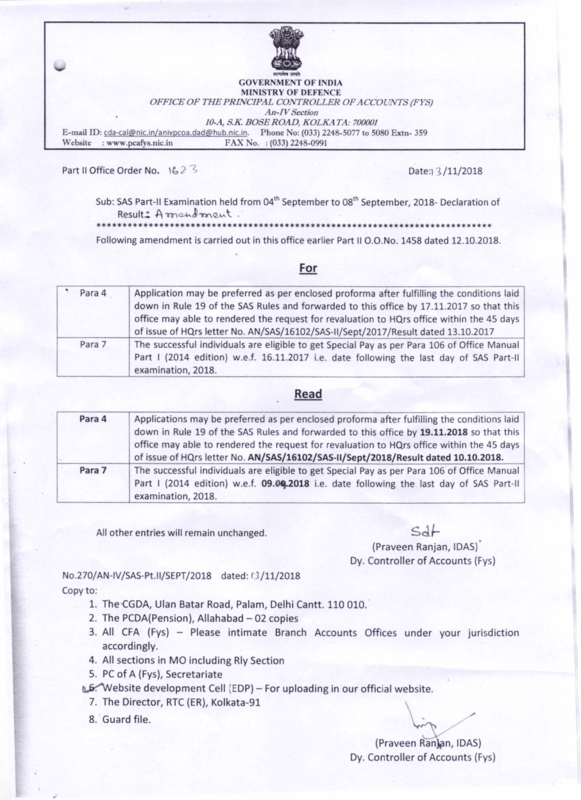 Para 4 - Applications may be preferred as per enclosed proforma after fulfilling the conditions laid down in Rule 19 of the SAS Rules and forwarded to this office by 19.11.2018 so that this office may able to rendered the request for revaluation to HQrs office within the 45 days of issue of HQrs letter No. AN/SAS/16102/SAS-II/Sept/2017/Result dated 10/10/2018. 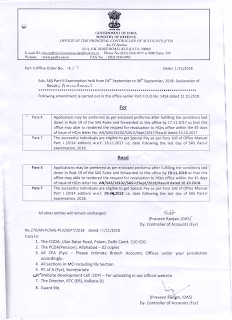 Para 7 - The successful individuals are eligible to get Special Pay as per Para 106 of Office Manual Part I (2014 edition) w.e.f 09-09-2018 i.e date following the last days of Part -II examination, 2018. 1. The-CGDA, Ulan Batar Road, Palam, Delhi Cantt. 110 010. 3. All CFA (Fys) - Please intimate Branch Accounts Offices under your jurisdiction accordingly. 6. Website development Cell (EDP) - For uploading in our official website.